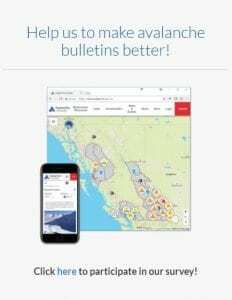 Simon Fraser University – Avalanche Canada is conducting a survey to determine how to improve avalanche bulletins. Alaska has remained one of the top states in the nation for avalanche injuries and fatalities. 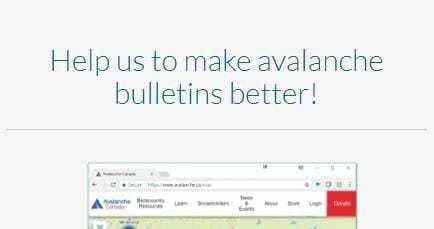 We want to be effective in sharing information and helping backcountry travelers assess avalanche conditions and terrain. We need your help to make this happen in the best way possible. Canada has been investing hundreds of thousands of dollars in forecasting and information sharing. This survey is another investment that is sure to pay big dividends if lots of people participate. We encourage you to take the time to complete the survey. You might learn something or be surprised. And you will contribute to the body of knowledge that exists in the world of avalanche safety. Thank you!